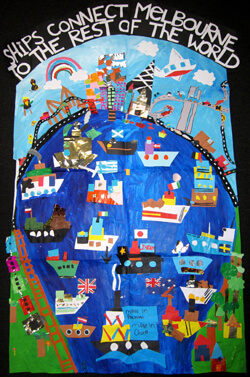 These units of work are designed to link the AusVELS curriculum with the daily activities of the Port of Melbourne. Connecting student learning to the world outside the school gates greatly increases student engagement and the likelihood that students will retain the information over the long term.The Port of Melbourne plays a vital role in our everyday lives and Port of Melbourne is pleased to provide teaching resources which explore the port’s operations and international trade within the framework of the current school curriculum.Port of Melbourne offers tailored classes to fit with the AusVELS curriculum which bring to life the resources available on our website.See our Port Education brochure (PDF 1.8 Mb) for more information. We welcome teacher feedback and suggestions on the current units and the development of new units.